Pot-bellied pigs are a big commitment; they have many needs, and they can live 20 years or more. Unlike production pigs, which can weigh up to 900 pound, most mature potbellied pigs weigh between 100 and 250 pounds. They're typically less than 20 inches tall. Check your zoning laws and homeowner's association regulations to be sure you can legally keep pot-bellied pigs. Pot-bellied pigs can live full-time in a safe outdoor enclosure or inside the home -- Those who live indoors need plenty of time outdoors. 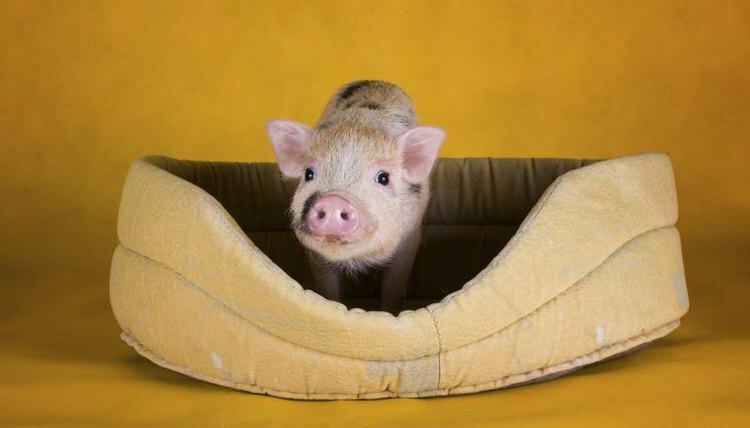 In the house, pot-bellied pigs need a space of their own with a bed, pillow or blankets. This space may be a large dog crate, a closet or a quiet room. If you have more than one pig, or other pets in the household, each should have his own bed. Some pigs like to sleep together; others prefer to sleep alone and should have the option to do so. Place potted plants on tables out of a pig's reach. Create an indoor rooting box for your pig using rocks or balls. Teach your pig to use the box by sprinkling treats in it. Give you pig plenty of toys. Good toys include old magazines, old shoes and clothes, balls, dog and cat toys, and toys that can be filled with treats. You can potty-train a pig to go outside in the yard or in a litter box in the house. Pigs don't like to step over things, so make sure that at least one side of the litter box has a low edge. Fill the box with pine shavings, old towels or pads. Train your pig to use the litter box by placing him in the box when he wakes and after he eats. If you catch your pig eliminating outside the box, pick him up and place him in the box to finish. Indoor pigs need plenty of time outdoors to root and get necessary nutrients from the soil. Some pigs will prefer to live outdoors most of the time. Pigs do not climb or jump, so the fence or enclosure walls do not need to be more than 4 feet tall. Your pig should have shelter and bedding. You can use a pillow, blankets or timothy hay for outdoor bedding. If the temperature drops below 50 degrees Fahrenheit, your pig needs access to a heated shelter. Unlike people, pigs do not sweat and cannot cool themselves. In warm weather, your pig needs access to shade and water, such as a wading pool, where he can keep cool. Provide commercial feed formulated for pot-bellied pigs. The protein content should not exceed 14 percent, so dog food is not an appropriate diet for your pig. Pigs should be fed an average of 1.5 and 2 cups of food per day, divided into at least two meals. The amount varies based on your pig's size and activity level. You can give your pig leafy vegetables and iceberg lettuce as a snack. Fresh fruits and vegetables can also be given as snacks, but they may cause your pig to gain weight. Feed fewer fruits and vegetables if your pig grazes on the grass in your yard. At his ideal weight, you should be able to feel a pot-bellied pig's hip bone through the layer of muscle when you gently press with your fingers. If you have to search for the bone through layers of fat, your pig is overweight. Adjust his diet and exercise levels to maintain a healthy weight. Pigs need access to fresh water at all times, both indoors and out. Pigs need exercise to maintain a healthy weight and to prevent destructive behavior. Encourage movement and engage your pig is to hide food or scatter it around the yard. This allows them to root and move around the property in search of more food. You can also walk your pig with a harness and leash, and you can train them to sit and shake using treats and praise, just as you would train a dog. A potbellied pig enjoys playing with toys, just as other pets, such as dogs and cats do. Potbellies are quite intelligent and enjoy toys that are challenging, especially if they contain small pig treats or pig chow inside for his reward in solving the puzzle. Heavy, rubber dog treat dispensing toys are among the favorite toys for potbellied pigs. Also, pigs naturally love to root with their noses and enjoy toys and games that let them explore surroundings as they would in the wild. Hiding pig pellets or small treats in blankets allow your pig to root around with his nose to find them. Pigs also love a dirt box to root in on an outdoor patio so they can find a favorite toy or treats in it. Potbellied pigs require daily exercise and engaging activities to stay mentally and physically healthy according to the Merck Veterinary Manual. Before getting a pot-bellied pig, locate a veterinarian in your area who accepts pigs as patients.Treatment methods for pot-bellied pigs are different than those used in farm animals, so a farm vet may not be appropriate. Common diseases among potbellied pigs include Campylobacteriosis, Atrophic rhinitis, Ringworm, Salmonella, and Yersiniosis. Vaccinate your pig every year against hemophiles, pleuro pneumonia, rhinitis and erysipelas with the vaccine Pleurogard 4 and against microplasma pneumonia with the vaccine Respisure. Deworm your pot-bellied pig with ivermectin. Most pot-bellied pig health problems are a result of improper diet. Underfed pigs may die from malnutrition. Overweight pigs may develop arthritis or heart problems, or may go blind. Stress can also kill a pig. If your pig is stressed for more than a couple of minutes, he may be experiencing porcine stress syndrome. Some symptoms of stress include squealing, grunting or making a clicking sound in the mouth; flinging his head from side to side; raising his hackles and twitching his tail. It is critical that you calm him down by removing the thing causing stress and covering him with a blanket.